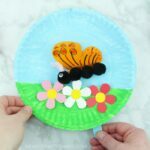 This simple paper plate butterfly craft for kids is super easy and quick to create using colored or decorated paper plates from the store. 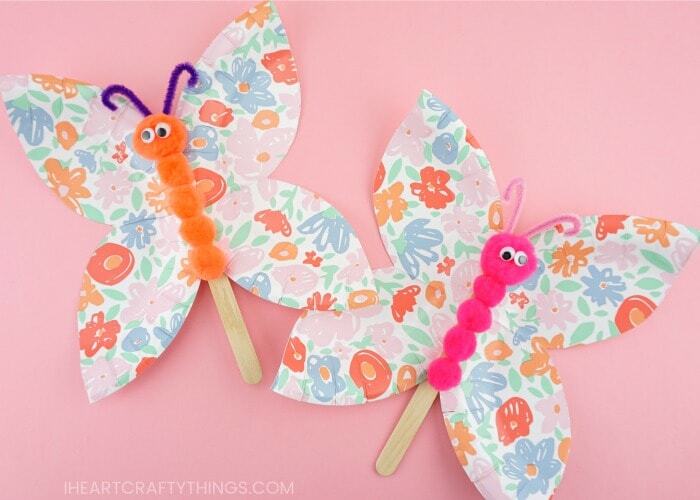 We happened upon these colorful floral paper plates at Target and they were perfect for creating some butterflies for an easy spring craft. The pastel colors and flower print on these paper plates we used gave each butterfly a lovely spring theme. 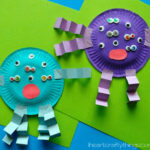 Adding the bright and colorful poms and pipe cleaner antennae was a delightful finishing touch to this easy paper plate craft. 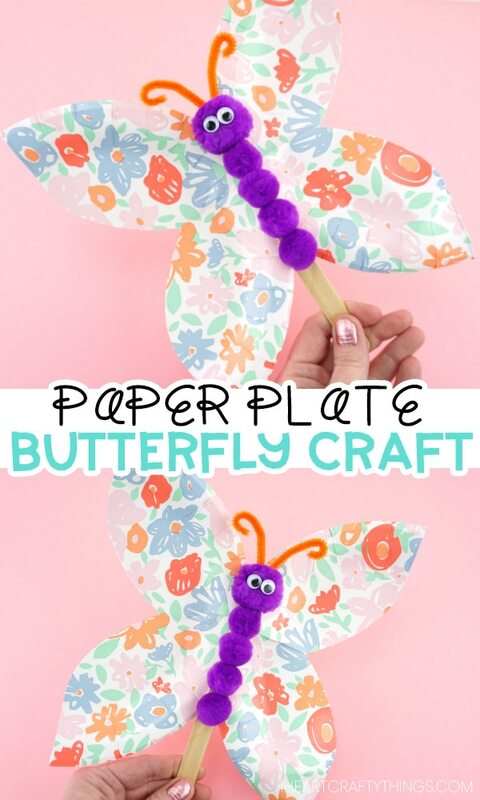 If you want to add some extra creativity to this simple butterfly craft, you can swap out the floral paper plates for a white paper plate. Then allow children to decorate the wings on their own using markers, crayons, glitter glue or stickers. 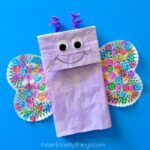 This colorful craft for kids is a perfect compliment to an insect or butterfly theme in preschool. 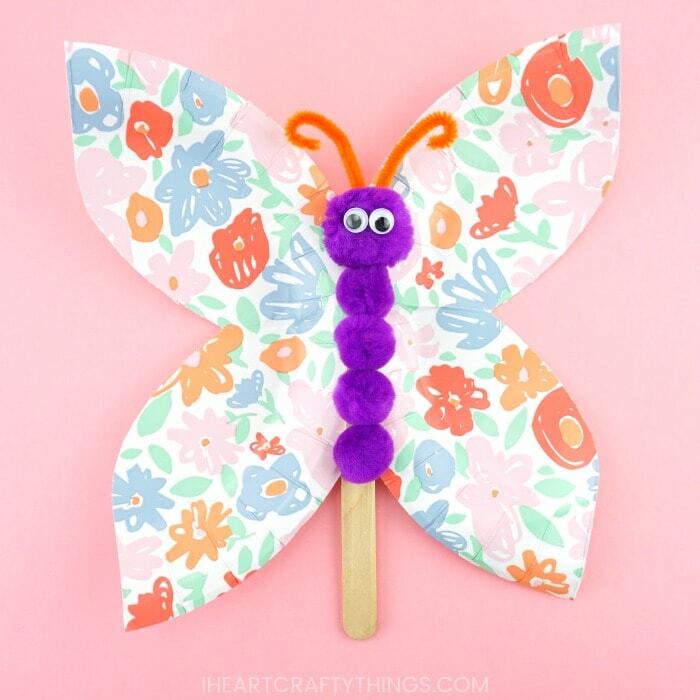 Kids will not only have fun making their butterfly, but the added holding stick on the back of the butterfly makes it an excellent puppet for preschoolers to fly and flutter around the classroom for extra fun. Step 1: Fold your paper in quarters. Do this by folding it in half once and then in half one more time. Don’t worry about bending up the paper plate if it is stiff. I flattened the edges of mine while folding it and the butterfly still turned out great. Step 2: Use a pencil to draw a curved line about one-inch in from the pointed edge of the paper plate to create the shape of your butterfly wing. Step 3: Cut along the curved line you drew with scissors. 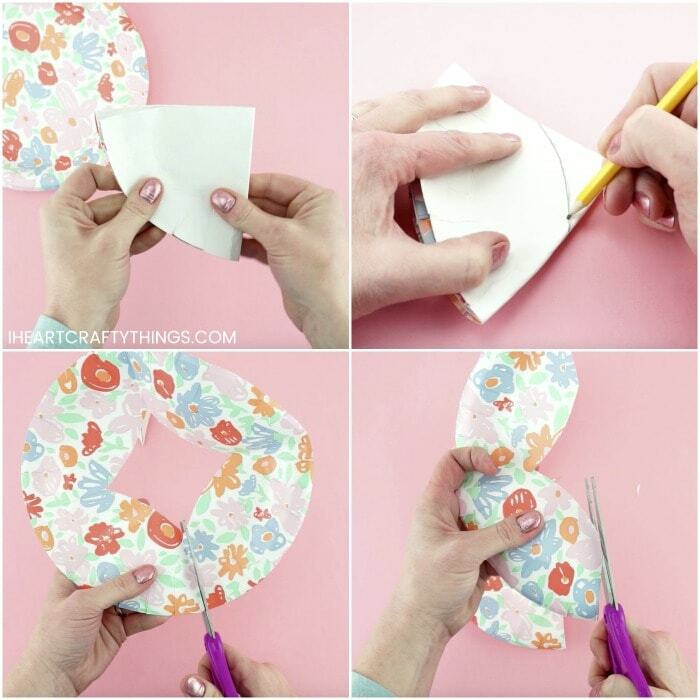 Open up your paper plate and cut down the middle of the paper plate at the top and bottom of the diamond shape in the middle of the paper plate to separate the wings. Then use scissors to round out the shape of each of the butterfly wing. Step 4: Add a line of hot glue down the middle of the outside edge of one of the paper plate halves. Then glue the other paper plate half down on top of it with the outside edge facing inward. You now have a gorgeous set of butterfly wings to attach your butterfly to. Step 5: Add a dot of hot glue on the end of your 4-1/2 x 1/2 inch craft stick and glue a 1-inch pom on it. Continue adding dots of glue up the craft stick, gluing on all four of the 1-inch poms and the 1-1/2 inch pom at the top for the butterfly head. Step 6: Glue two small googly eyes on the face of your butterfly. Step 7: Make the butterfly antennae with a pipe cleaner. Bend the pipe cleaner and cut in half. Then bend the pipe cleaner in half to make two antennae. Bend down and fold the two ends of the pipe cleaner to make the ends of the antennae curly. 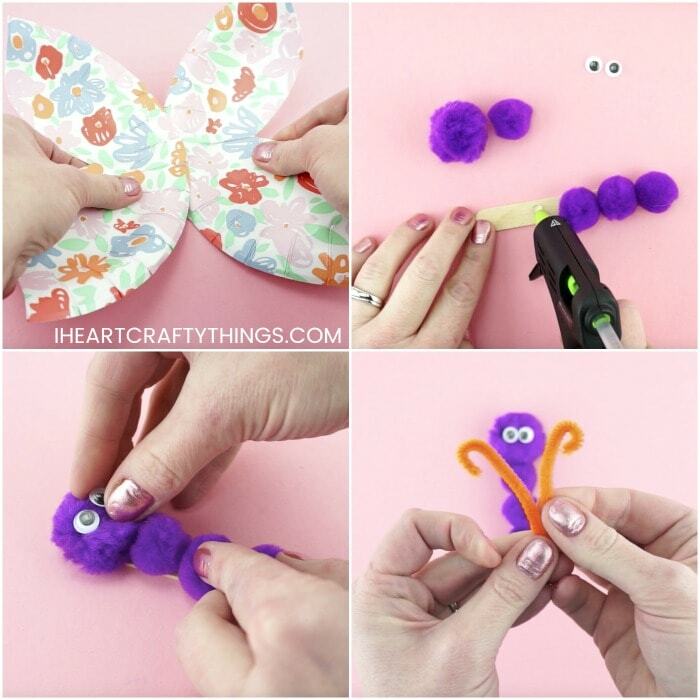 Step 8: Add hot glue at the top of the craft stick, directly behind the butterfly face, and attach the antennae. Step 9: Add a line of hot glue along the middle of your paper plate butterfly wings and attach the butterfly body to the wings. 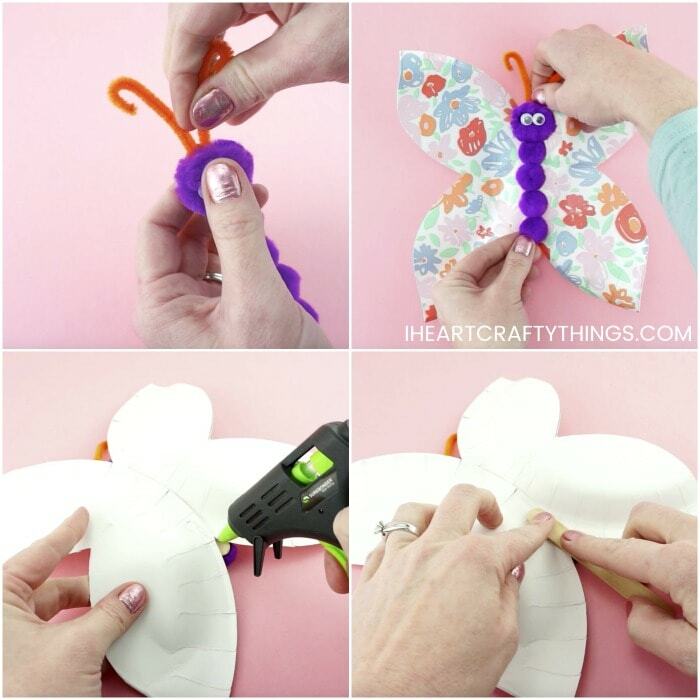 Step 10: Turn your paper plate butterfly over. 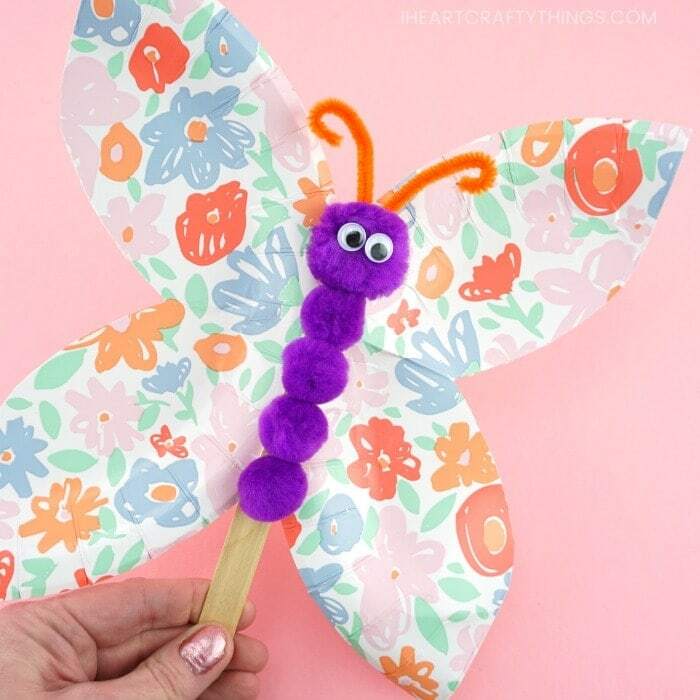 Add some hot glue at the bottom of the butterfly wings, in the center, and attach a second craft stick to the glue for a handle. 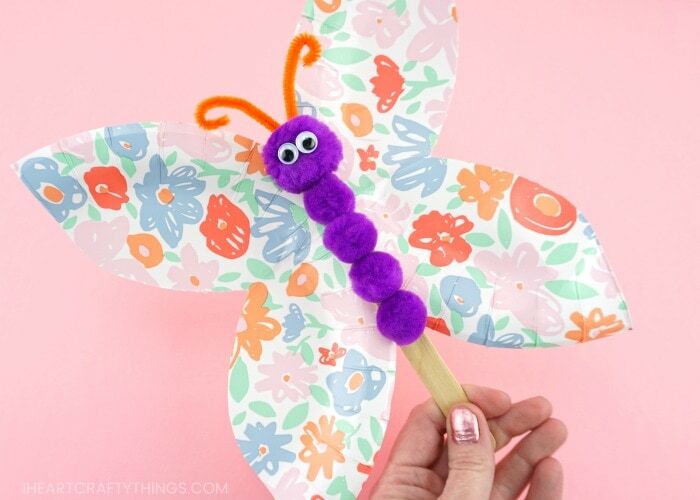 To play with your paper plate butterfly, hold the end of the craft stick at the bottom of the butterfly. Then move around the stick and have fun flying and fluttering your butterfly around. 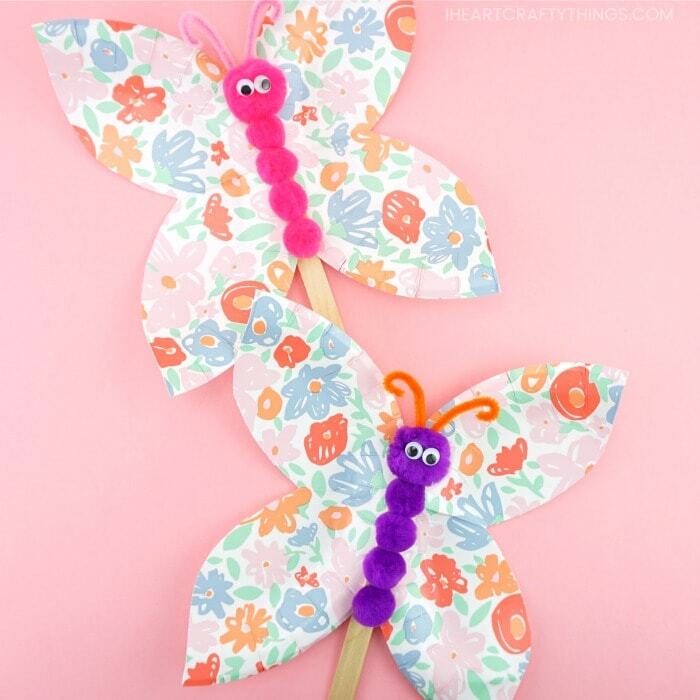 Watch the video below for a step by step guide on how to make this easy butterfly craft. 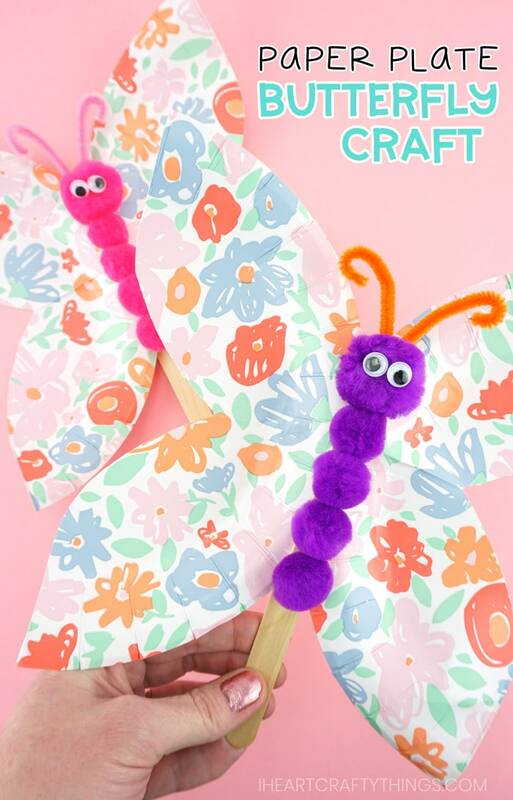 Find more spring crafts and butterfly craft ideas by browsing the categories at the top menu bar of our website. 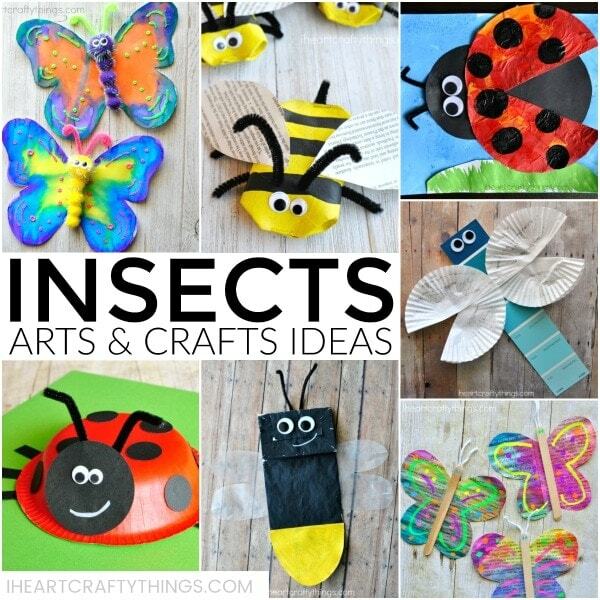 Want more insect craft ideas to make with your kids? We have a huge collection of butterflies, ladybugs, bees, dragonflies and lightning bugs for your to choose from. 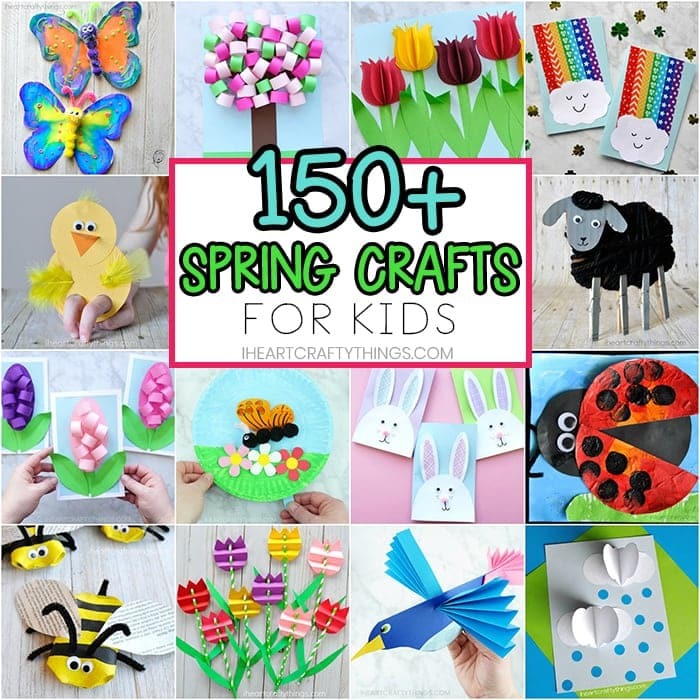 « 75+ Awesome Bird Crafts for Preschoolers -The Ultimate Resource!